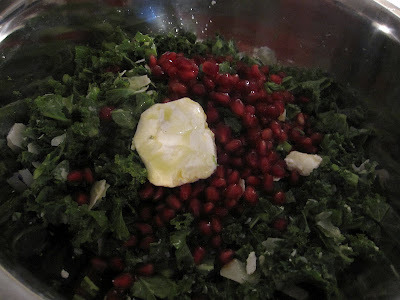 Yes, my honey decided to make the kale salad for dinner last time we had it and it turned out so much better than anything I've ever done with it. So I'm sharing his genius with you. This would be an AMAZING giant summery/fall salad with a few mixed and matched ingredients, depending on your mood and the weather. It'd be great with grilled chicken, shrimp, or even some chilled udon sesame noodles to spice things up a bit. I'll show you how he made it but of course, feel free to get creative with it! Use what's in YOUR fridge, YOUR pantry! 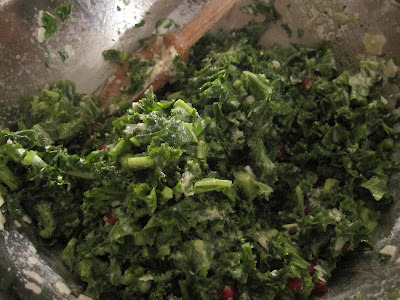 Kale is a WONDERFULLY blank canvas for using up leftover bits of this and that. I always suggest starting with at least a base of freshly squeezed lemon juice. I think the contrasting taste of the bite-y kale with the sour citrus is absolutely divine. We had one orange that was about to go bad so we juiced that and tossed it in as well. And now the fun starts! What little "bits" do you have hanging around that are too small to use in a full meal but too good to just throw out? For us it's usually some kind of good cheese and a random ingredient like golden raisins or a ramekin full of cottage cheese. GET IT OUT and TOSS IT IN! We had a big pinch's worth of grated asiago and parmesan, half a container of pomegranate seeds and the end of a block of goat's cheese. Tossed it all in, mixed it around and James still thought it was missing some punch. He drizzled in a little olive oil and sprinkled on some sea salt... then he went for the bowl of hummus. And friends, it was his most genius move. 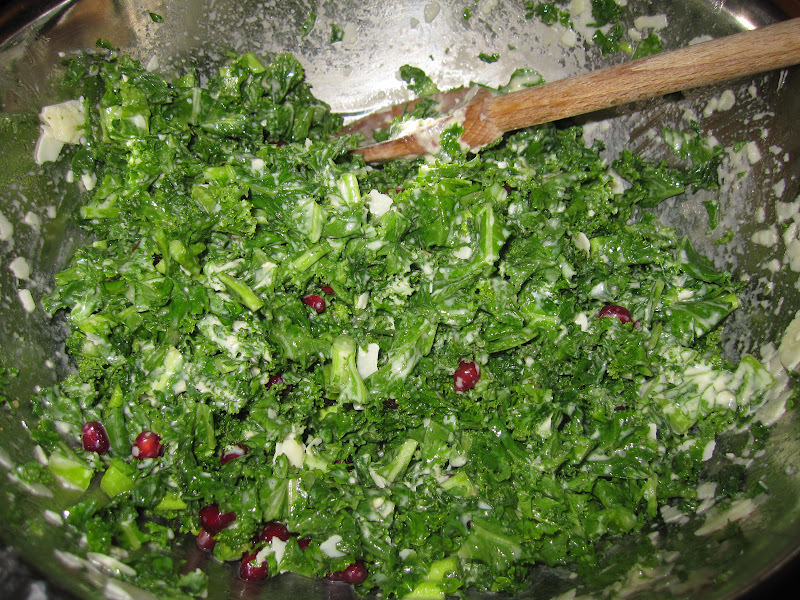 "Kale is a member of the brassica family, rich in potent cancer fighting substances called indoles. Loaded with bone building Vitamin K.
Helps the liver detoxify carcinogens and other toxins. HIGHEST ANTIOXIDANT RATING OF ANY VEGETABLE"
SO DIVE INTO THAT STUFF! 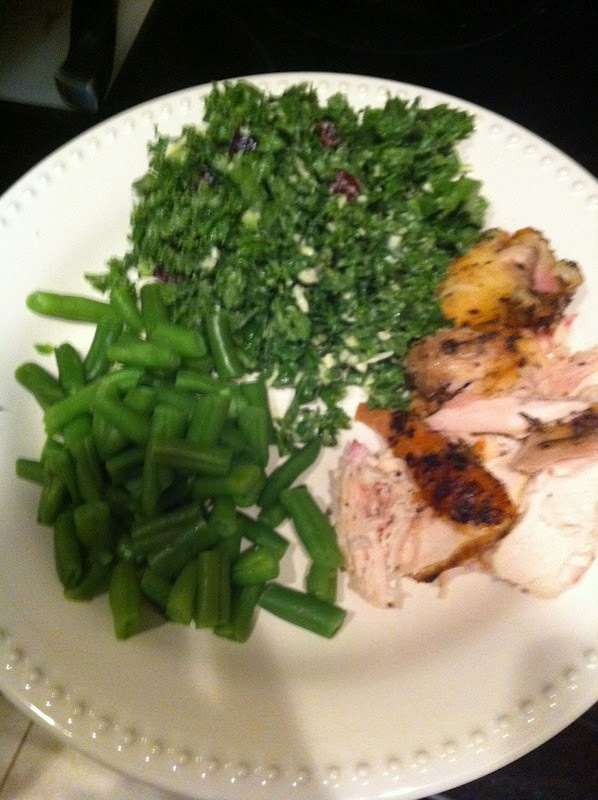 Make it for dinner! Make it for lunch! Make it for that salty, sweet midnight snack and keep it in the fridge at all times. You can feel good about munching on this goodness as often as you like. Babe, I like the nutrition facts about the recipe - great info! Makes me want to try the recipe even more... good research!!! Good job, Jimmy!